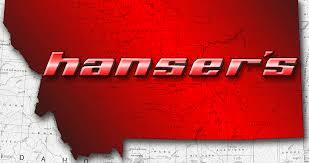 Hanser's Automotive Wrecker Company is a single call for all your automotive needs. They will celebrate their fifty year anniversary in 2015! They have six locations - Billings, Big Timber, Columbus, Livingston, Lewistown and Hardin with five roadside service trucks, excavation equipment & specialized hasmat emergency response units to serve all locations. Hanser's repair facility includes includes 29 service bays & a hoist capable of lifting up to 60,000 pounds providing service for diesel & motor coach repair. 125' drive through bays mean tractor & trailers do not have to be separated. Their inventory of 2,000+ late model cars & trucks offer a great selection of clean used parts that include a full warranty.. There is 60,000 sq' of building with 100 enthusiastic employees throughout Montana to serve you! Call them at 248-7795 or visit their site at 430 S. Billings Blvd. www.hansers.com .